Jenny Jen42: chair-e-ty...save the date! 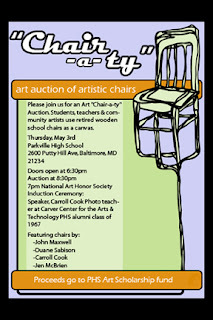 save the date for May 3rd....Parkville HS is having a chair-e-ty to raise money for our art scholarship fund. we keep churning out more and more future art students, many actually wanting to be art teachers, so we thought we would try to raise our amounts of what we give to our very hard working dedicated, graduating art students. the chair-e-ty is an auction of wooden "retired" chairs that have been artistically manipulated by Parkville High Alumni Artists, as well as staff and area artists. Carroll Cook, photo teacher at the Carver Center for the Arts, is celebrating his 40th. high school reunion by being our guest speaker, as well as one of the chair artist. Other chair artists include Jonathon Maxwell,Duane Sabiston,Marcia Metzler,Denise Webster,Tricia Lane, James Bullough,Christina Gagliano,Angie Dunn,John Deamond, Annett Deamond, Becca Bridges, Amy Reid, Ben Plum, Dave Meekins, Chelsea Grubbs, and current art staff of PHS, myself, Anne Talman, Jim Hesser, Ryan Twentey and Paul Pavik. Chairs will be auctioned via silent auction that will end at 8:30 that evening. Carroll speaks at 7PM, doors open at 6:30. Student artwork will also be displayed...and of course we will also provide refreshments! I will post pictures of chairs as we receive them.